If you are fairly new to bike track days you might not have any knowledge of what the racing line is. You may have even been taking part in track days for a while, but there’s a chance you might not be familiar with exactly what it is and how it helps us. In this article I’ll share with you the basics of a racing line and exactly what you’re trying to achieve with it. What is the Racing Line? Put simply, the racing line is your attempt to create the largest possible radius when travelling from your turn in point, through the corner and out to your exit point. Sounds pretty straight forward, but let’s look into why we do this. Looking at the diagram below, I have detailed three possible lines through this 90 degree right hand bend. Let’s look at how the lines differ. 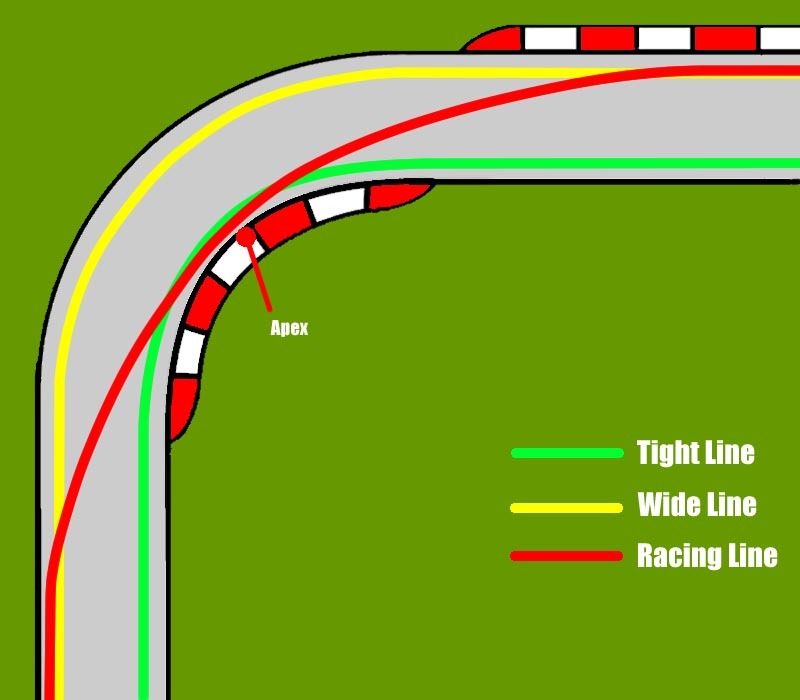 Tight Line – The tight line sees you approaching the corner on the inside of the track with the intention of staying on the inside throughout the whole corner. Because the inside of the bend is a smaller radius, we need to turn tighter to stay on the inside of the track, which also means we have to scrub off a lot of the potential corner speed to stop ourselves shooting off the other side of the track on the exit. Wide Line – Things start to get a little faster on a wide line. By staying on the outside of the track throughout the turn we can now take more speed into the bend because the radius of the turn is somewhat larger than the tight line. This sounds good, but because we’re effectively taking the long way round the extra speed doesn’t make a massive difference time wise because we have to travel a greater distance to complete the turn. The Racing Line – This line through the bend sees a combination of both the previous lines. The act of starting on the outside of the track, turning in to meet the inside, and then naturally moving back to the outside creates the largest possible radius for the turn, meaning even higher achievable speeds. With the racing line you are trying to straighten out the corner as much as you can and in doing so you create a flatter arc. A flatter arc means you don’t have to turn as sharp, which therefore means you can carry more speed into and through the turn. It’s fairly simple when you break it down, we can travel faster in a straight line than we can when turning, so by using the racing line through a bend you are making it as straight as possible to maximise corner speed. Try to adopt the racing line when you’re next out on track to both increase your corner speed, but also increase overall safety by giving yourself more room for error.